This gallery is designed to introduce geologists to the Permian basin carbonates, evaporites and clastics from shallow water to deepwater settings exposed in the Guadalupe Mountains and buried in the adjacent subsurface. While all geologic occurences of carbonate and clastic sediments have a "unique" character imposed by the specifics of the depositional setting for that location and time, they also carry many common signals. This gallery of photographs should help you identify common and different signals for the carbonates you can see in the Holocene and the ancient. Most of these photographs were taken by Christopher Kendall while making field observations of the Permian basin carbonate shelf and reef margin complex, probably the most well known and most thoroughly studied ancient carbonate platforms of the world. 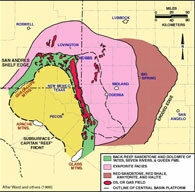 These carbonates have accumulated here through the Permian in this setting which at its inception was the Tobosa Basin. The sedimentary fill has responded to changing sea level and productivity. Most of the materials and text used on this site are based on the publications and the compendium of information assembled by Christopher Kendall and colleagues he has worked with over the years. Some of the maps and diagrams presented in the below are from the publications linked to the page.